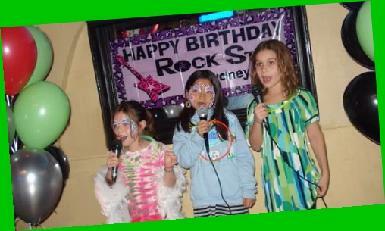 Make Your Child's Next Party -- A Karaoke Party!!! Big City Karaoke is available for your child's next party, guaranteed to entertain guests of all ages! Custom party packages to accommodate any budget. We can come to your house, local restaurant or even a bowling alley. We have over 100,000 songs in our library including songs from today's most popular kids shows & movies. Mobile light show, stage, audio equipment w/ wireless mics available. We "fill the silence" in-between singers with age appropriate dance music. Custom message & theme displayed on TV screens in-between karaoke singers.